I’m SO happy you’re thinking of booking a Dog with a Bow Photography Session. Let’s get all the details out of the way as soon as possible. That way we can get one step closer to what really matters…me meeting your awesome pup (s)!! 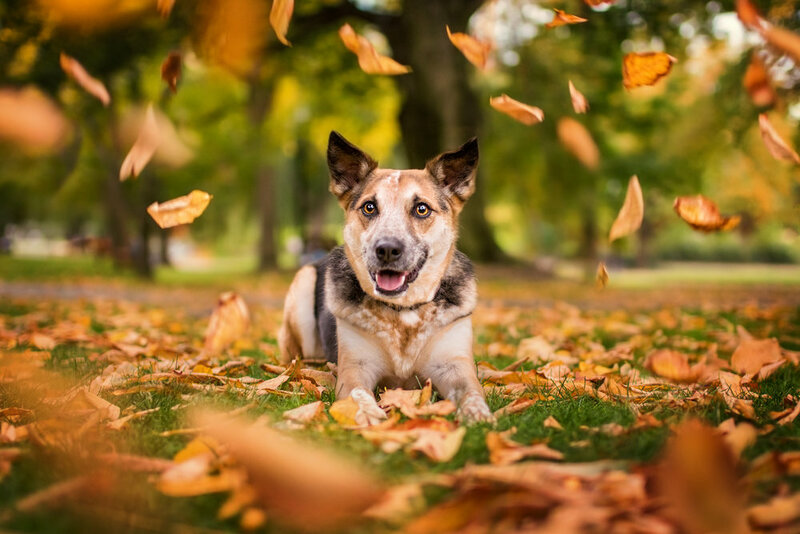 Our goal : Our photography sessions have one goal in mind - to get you some of the most incredible pieces of wall-art of your fur baby you’ve ever had the chance to hang. The big news : the Session Fee is no more! Yes, you read that right! I’m so pleased to introduce a new, simpler Session Retainer. Now the FULL $300 you spend on your session is fully redeemable against all of our Signature and Classic Wall-Art. The best bit? The FULL $300 Session Retainer becomes a $300 Product Credit redeemable against any of our products in Step Two! 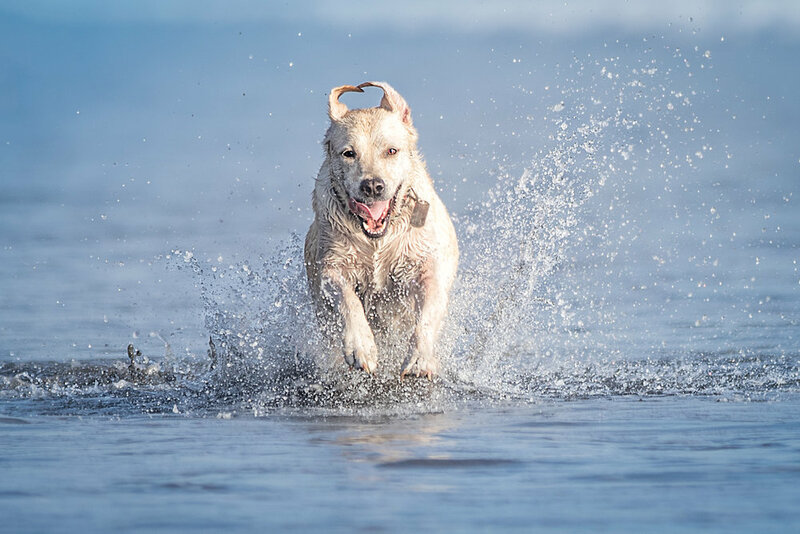 You’ll find the details of all our Signature and Classic products below but you’ll have the choice of a variety of stunning pieces to showcase your dog (s) in all their glory. Gallery wrapped canvasses, natural wood prints, modern acrylics, stunning metals and truly one-of-a-kind barn-wood framed prints. The choice is truly yours. If you have limited wall space, that’s not a problem at all. Our Signature Session Albums are an excellent choice to have all visitors to your home ignoring you while they flick through the pages, admiring your adorable pup. The Dog with a Bow Photography experience is ALL about creating beautiful customised wall-art and luxury coffee table albums. As above, we are all about wall-art and albums here at the Dog with a Bow Photography. We do however understand that this is a digital world, and those shiny gigabytes of data have a place too. They allow you to print thousands of copies of that gorgeous head tilt photo after all. Although we don't sell digital files, we are delighted to be able to gift them with the purchase of any of our Signature or Classic Wall-Art! And everyone loves a free gift, right? For EVERY single piece of wall-art you purchase from our Classic and Signature product range (details below) we will gift you with that image as a high resolution digital file, as well as the corresponding social-media sized version ready for sharing on Facebook and Instagram. And that’s not all. We love giving away free gifts so much that we have an additional bonus for you too. After your session you will have the choice of Signature and Classic products from our current Product Guide. The below options are subject to change but are current as of today’s date. 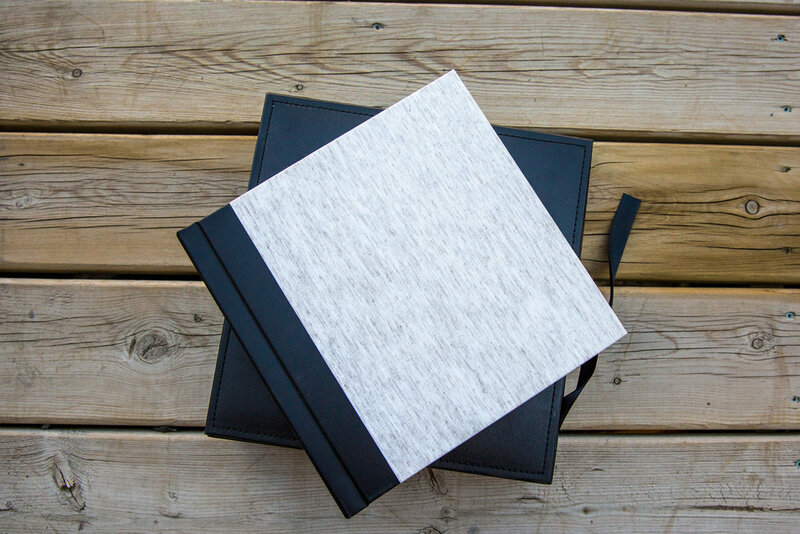 Our custom designed photobooks and albums feature a deluxe leather or linen cover (or your favourite image as a photo-wrapped cover.) Session Albums are printed on beautiful lay flat pages. 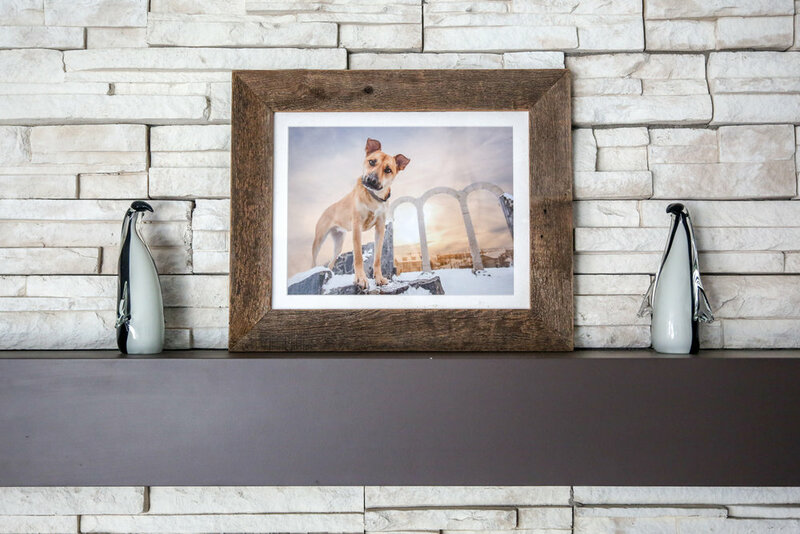 Now that we’ve got your walls or coffee table looking amazing, you’re free to purchase as many of the following smaller products as you’d like as the perfect add-on addition to your Dog with a Bow Photography experience. Featuring the perfect size prints to give as gifts, as well as desk-sized acrylic blocks for your office. The same vibrant and modern look of our acrylics in a handy desk size version. Mounted to 1" thick plexiglass with hand polished edges. A perfect gift-sized version of our unique, one-of-a-kind barn-wood framed prints. Available in a choice of finishes, with a choice of coloured mats with enclosed backing and ready to hang straight out of the box. Ready to book? Perfect…let’s get you booked in. Simply fill in the form below and I’ll get back to you with available session dates asap! Do you only photograph dogs that are perfectly trained? There’s no way my dog will stay still. Will that be okay? My dog is so shy or afraid of people. This can’t work for us right? My dog is not as easy-going as some dogs you photograph. In fact…they’re very reactive and CANNOT be near dogs/people. Is that okay? My dog can absolutely not be off leash. Is that going to ruin the pictures? Where do we do the photos? Q: There’s no way my dog will stay still. Will that be okay? A: That's not a problem at all...honestly, it's really not! As fast as they are, I assure you my camera is faster! I shoot with a lightning quick lens, at a shutter speed that could capture a formula 1 race car in perfect focus. Even if you have a greyhound...I promise I can capture their picture. I need less than 1/1000th of a second of stillness to capture a picture for you. And if they want to run...well action shots can be cool too! Q: My dog is so shy or afraid of people. This can’t work for us right? A: I totally get it. Maybe they are a rescue and you have no idea what happened to them before you gave them a new home. Maybe they've had a bad experience more recently. Maybe they're just super cautious. Whatever their history, I can work with them. That could simply be using one of my many lenses to stay a distance away that your pup is comfortable with. I can ZOOM in and still get beautiful images for you. 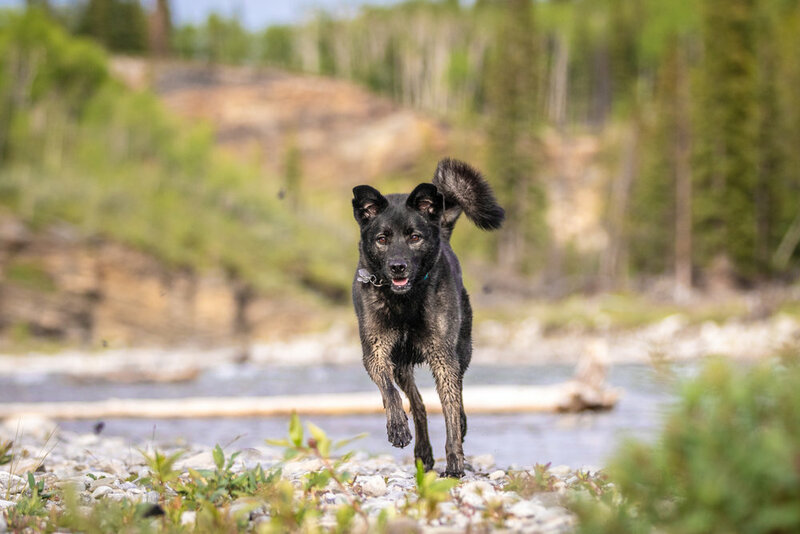 I volunteer regularly with 3 rescue centres here in Alberta and I've had a dog in my life since I was just 6 months old. I therefore have encountered all sorts of dogs throughout my life. 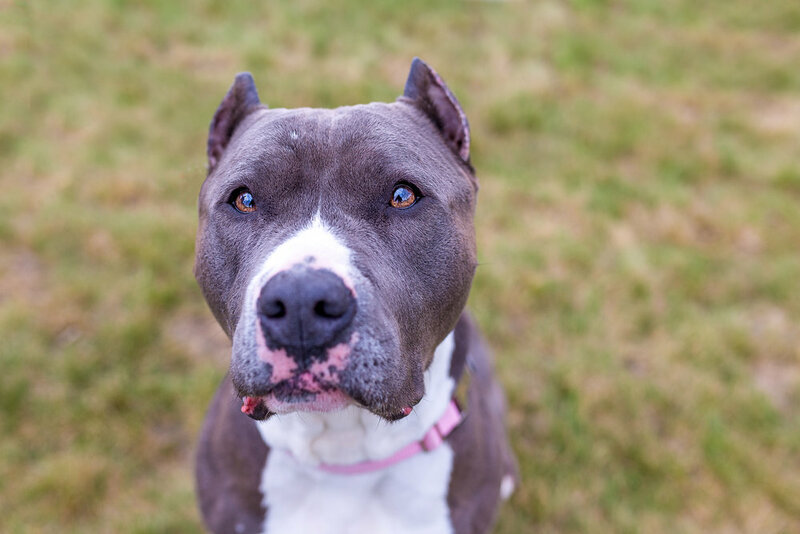 I have an excellent understanding of dog body language, and will use all the knowledge I've accumulated to make sure your pup feels comfortable and ready to be a star! Q: My dog is not as easy-going as some dogs you photograph. In fact…they’re very reactive and CANNOT be near dogs/people. Is that okay? A: No problem - location is so key to getting the beautiful image that you want, but we'll be able to find the perfect spot for your pup. I have so many options for great locations that I'm confident we'll find a secluded spot you are happy with. Q: Do you only photograph dogs that are perfectly trained? A: No… not at all. This is one of the biggest concerns pet parents seem to have. They are embarrassed at having to bring their mischievous little pup to a photo session. I promise you, whatever “challenges” your pup has, I’ve seen worse. Q: My dog can absolutely not be off leash. Is that going to ruin the pictures? A: No - not having your dog run for the mountains, never to be seen again, is of course the most important thing! If they need to stay on a leash - I can work with that for sure. Through magic (otherwise known as photoshop) that leash will disappear quicker than a cooked chicken left unattended and within the reach of a sneaky paw. Q: What are the hidden fees? Do you have more than 4 dogs? Wow...good for you! Send me a quick email to 1) explain how you do it :) and 2) to get a custom quote. The Session Package covers up to 2 dogs but if you want to more of a family shoot with a variety of shots, some with just the dog (s) and some with the whole family, people can be added for just $50 each. Q: Where do we do the photos? A: Well, I have a number of great locations in and around Calgary, Cochrane and Kananaskis Country for you to choose from. However if you had somewhere else in mind then that’s not a problem. Just let me know where you were thinking and I’d be happy to provide you with a quote for travel. 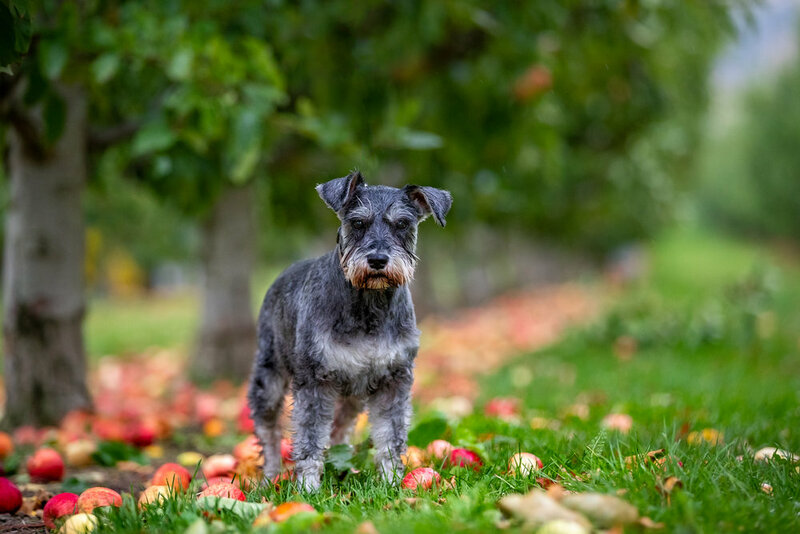 I’ve photographed in locations including Costa Rica, London, UK, New Zealand and throughout the US, and am happy to travel anywhere to photograph dogs!